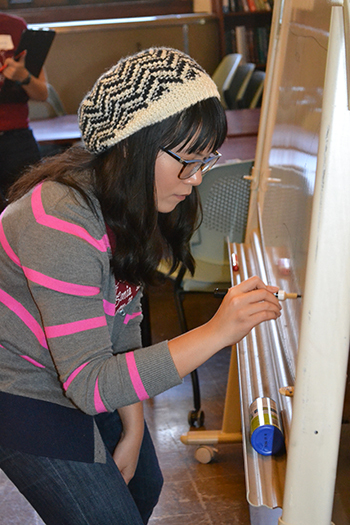 Second-year math PhD student Chi Huynh writes down some data points during one of the activities. 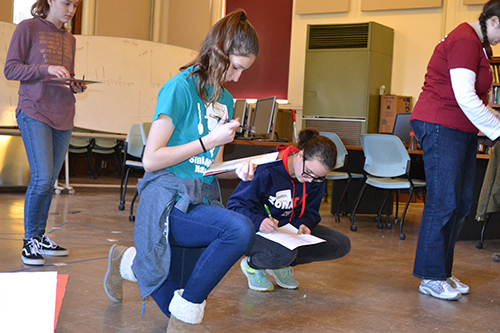 On Saturday, November 10, 2018, during Sonia Math Day, a number of math grad students from the Association of Women in Mathematics (AWM) put into practice the “Say what you know” idea, taken from the life philosophy of Sonia Kovalevsky. The annual event celebrates the life of Kovalesvsky, the greatest female mathematician prior to the twentieth century, and her impact—that women can succeed in and contribute to the field of mathematics. Benefitting from the AWM women’s wisdom (and that of some male students who support women in math), were five local girls who did some unique, math-related activities probably quite different from what they normally are exposed to in school. Plus, they not only met other local girls also interested in math, but networked with some role models during the event, women who are currently on a trajectory to careers in math. Organized by Dana Neidinger, a math PhD student and AWM Outreach Chair, Sonia Math Day featured not just hands-on activities, but some that had the girls, mostly 8th graders, along with a high school junior and a couple of freshman, up and moving around, in addition to drawing on paper, as they exercised not just their brains but their bodies as well. 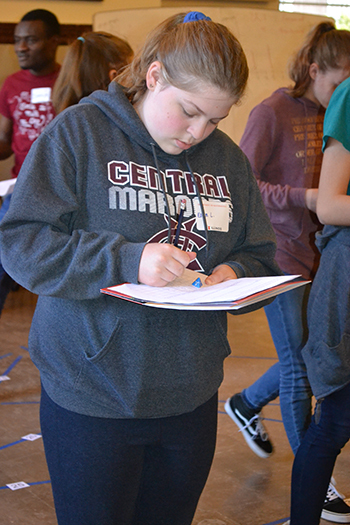 During Sonia Math Day, several participants write down data as they participate in the "random walk" activity. For example, the 1st activity, centered around graph theory, introduced the girls to Eulerian paths, Hamiltonian paths, and the traveling sales-man problem: (What is the shortest possible route to visit each of a number of cities then return to the city of origin?) During these, the girls not only worked on paper, but followed paths delineated by masking tape on the floor. Participants also took “random walks,” where they would flip a coin, step forward or backward, flip a coin again and so on. Then after recording the sequence of coin flips, they’d find the probability of where they would end up. A third activity dealt with mazes on topological surfaces and how the surfaces changed the paths available to follow. According to Neidinger, the goal of Sonia Math Day was to get the girls “very excited about doing math, and to say ‘Math is fun!’ and have it be something that they're really interested in looking at further.” Neidinger, whose research involves graph theory and number theory, organized the event, including recruiting math grad student volunteers to help out with the different activities. 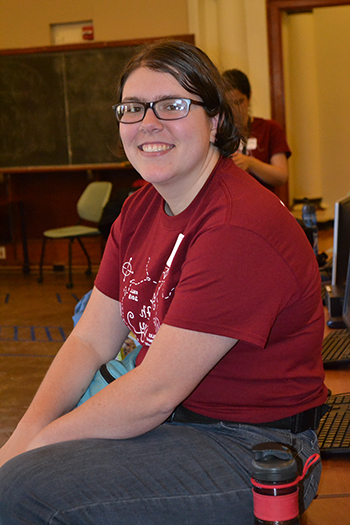 For instance, one second year math PhD student who helped with the event was Ran Ji. She claims that it has been important for her, personally, to be in an environment where she could “be surrounded by other women doing really cool and awesome things.” She reports that not only was she lucky enough in middle and high school to have female teachers who were really supportive, but that she actually went to a women's college for her undergrad degree. Second year math PhD student Ran Ji leads an activity during Sonia Math Day. “I could see that women can do science and math things," she relates, regarding her own experience, and I don't know that everyone has that in their school. So I wanted to make sure that they [the Sonia Math Day participants] had an extracurricular activity where they can see that,” she explains. A Central High freshman at Sonia Math Day for the third time enteres data during the "random walk" activity. Might a career in mathematics be in Ellen’s future? “I've considered it,” she asserts. More on Sonia Kovalevsky. A pioneer in mathematics, Kovalevsky, who was born to a Russian family in 1850, was exposed to mathematics at an early age—her room was supposedly papered in lecture notes from her father’s calculus courses. She was self-taught, and at the age of fourteen, taught herself trigonometry in order to understand a physics book. Second year math PhD student Chi Huynh explains the "random walk" activity graph. Although she struggled to obtain a formal education, facing negative attitudes about women attending universities and lacking a support system throughout her life, she became the first woman to receive a doctoral degree from a modern university. Plus, she gained tenure at Sweden’s Stockholm University, where she was also named editor of a math journal. During her career, Sonya published 10 papers in mathematics and mathematical physics. Following is one anecdote about how she changed perceptions about women belonging at a university. At the age of 20, she went to see Karl Weierstrass, hoping to study with him at the University of Berlin. He sent her away with a set of problems so challenging that he never expected to see her again. However, when she returned with the solutions a week later, he was so impressed that he began privately tutoring her because Germany didn’t allow women in universities. She worked under him for four years, finally earning a doctorate from Gottingen in 1874. First-year math PhD student, Olushola Soyoye, who volunteered for Sona Math Day puts his data points on the board. Sonia Math Day participants watch as one of the instructors add their "random walk" data to graphs on a white board.